One of the best things about relocating to a new part of the country is the access that you have to other cities that were miles away from you before. 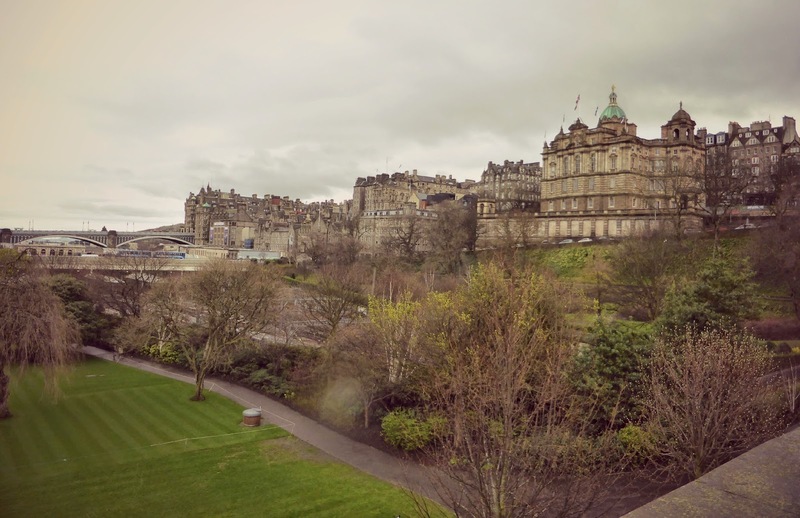 Edinburgh is just over an hour away by train which is too exciting as it's one of my favourite cities in the UK. I've been there a couple of times before but living in London I always chose to fly so it wasn't somewhere I got to very often. Now, thanks to my new life, I'm able to take a day trip there so yesterday we got up at the crack of dawn and took the train up north. 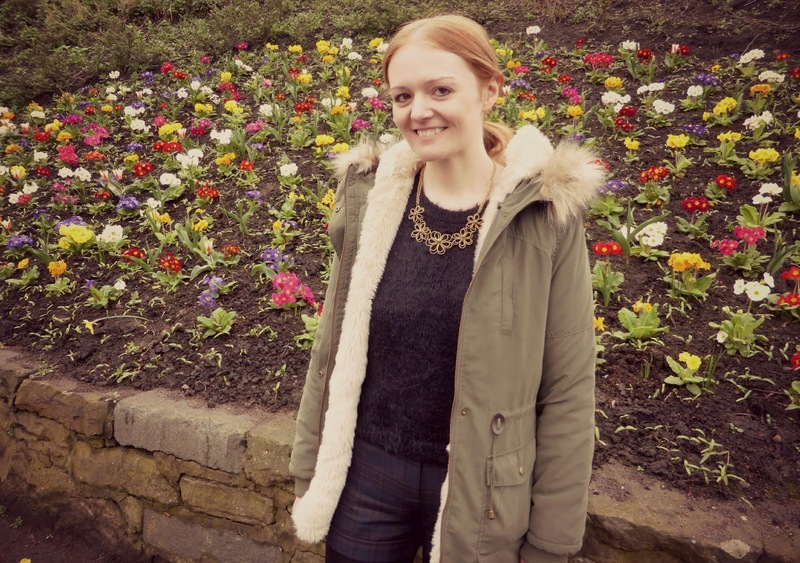 I decided that for a change I wouldn't over plan this trip, I'm very guilty of being too organised at times which doesn't always lead to the most relaxing time. I print off silly amounts of maps and make plans and suddenly everything is running to a tight schedule and we're rushing about like idiots trying to get too much done in one day. It was nice not to have an agenda although I think it threw Simon slightly when he asked what the plan was and I told him that there wasn't one. Of course me being me there was a tiny amount of pre-trip preparation including looking up where Primark was. Poor Simon, he found himself in Primark just after 9:00 am with me promising it'd be the only clothes shop I'd be dragging him in and that he could pick our next activity. Good job I've found myself a such a good guy because he was very lovely about it and even hunted round the store looking for mint green clothes for me to fuel my current obsession. Unfortunately I didn't find any good outfits this time but I obviously couldn't leave empty handed and left with a lovely statement necklace for £4.00 and a couple of pairs of pastel lace socks for £1.50 each. I'm not sure what I'm doing with the socks, whilst I'd love to be able to embrace the jelly shoe and lace socks look I think at the age of 33 I probably can't really pull it off! 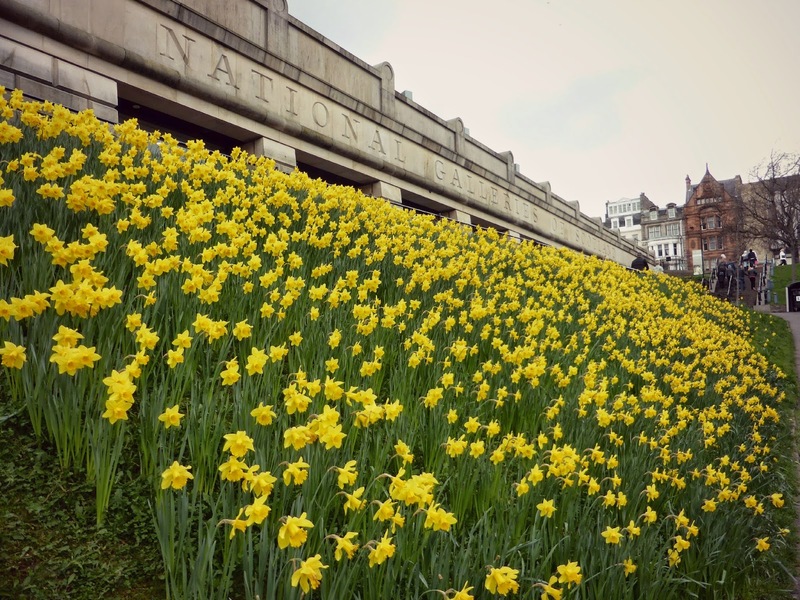 We then spent a little while strolling around Princes Street Gardens enjoying the gorgeous views up to the castle and appreciating all of the lovely daffodils. Unfortunately the weather was a little too cold and cloudy to frolic about in my Spring pastels so the cosy Primark tights were out again along with my boots and I obviously couldn't go to Scotland without wearing some tartan so I decided to wear my Red Herring shorts with my lovely new cropped jumper that I picked up half price from Tesco last week. 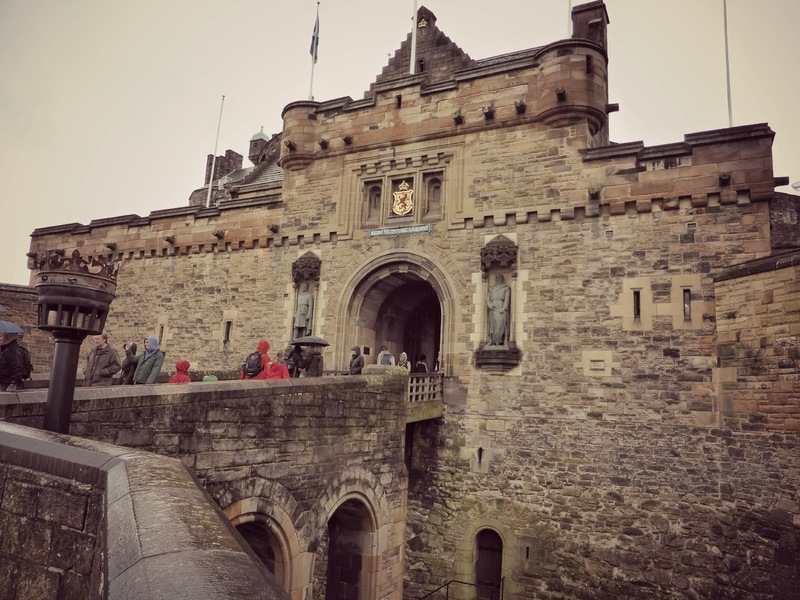 As we strolled up to Edinburgh Castle the rain started but it didn't dampen our spirits and we had a great time looking at the fantastic views across the city and beyond. Enjoying the view so much we've decided that we'll definitely return one day soon to dedicate some time to climbing up Arthurs Seat. The Royal Mile is a great place for a pre-lunch stroll and we spent a good hour nosing at all of the cafes and restaurants and looking at their menus. I absolutely love reading menus and we picked out a few places that we'd like to try next time. 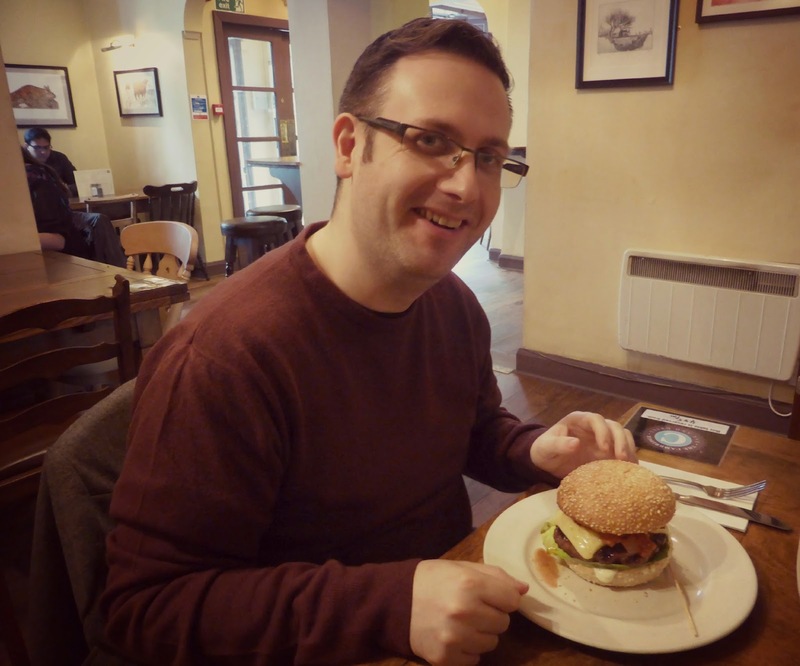 For this trip though it was Simon's choice and there was only one thing on his mind for lunch .... burgers! 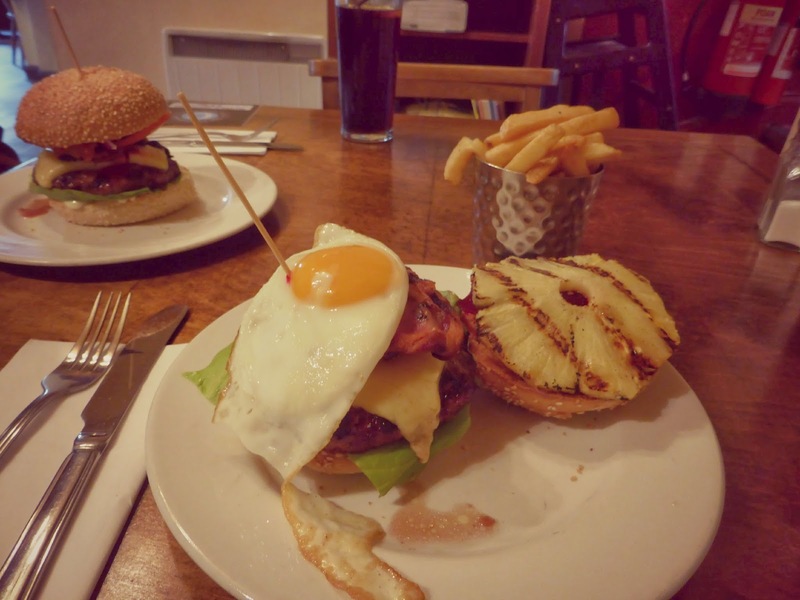 As I think I've mentioned before I don't usually bother ordering a burger unless it's an epic burger so we did a google search for "best burgers in Edinburgh" and the answer was the Cambridge Bar so we made our way there in search of some great burger combinations. 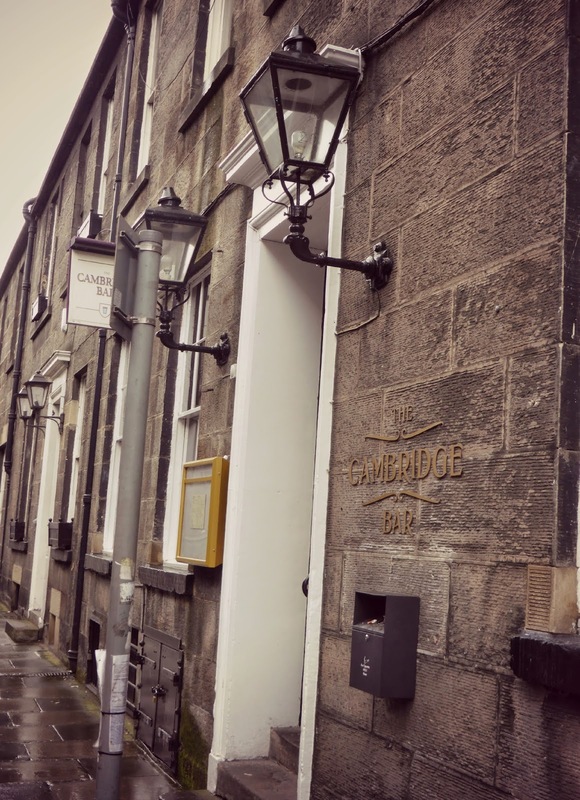 We weren't disappointed, the menu at the Cambridge Bar is mostly burgers (you can choose between beef, buffalo, chicken or veggie) and they have some gorgeous filling combinations and a nice list of added extras if your perfect concoction isn't already on the menu. 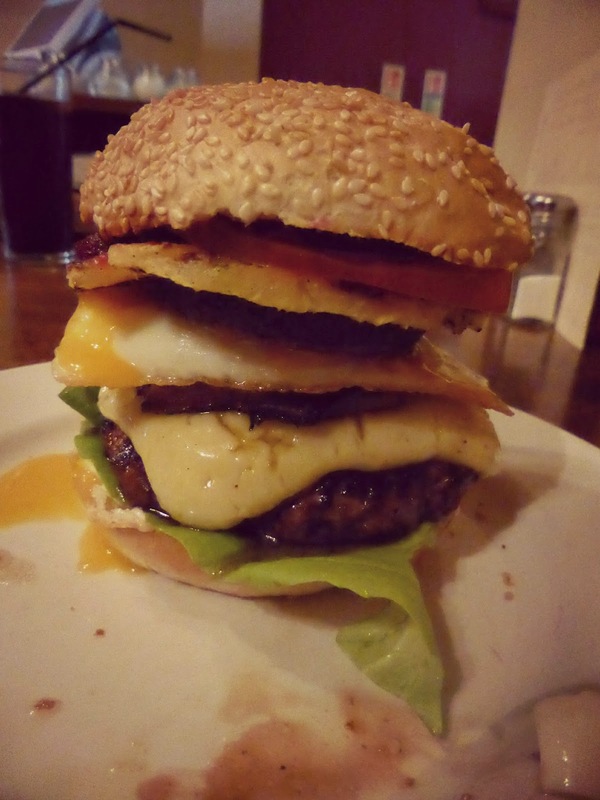 Always going for the biggest and best that I can I opted for the "Aussie" - a beef burger with pineapple, beetroot, bacon, onion, cheese and a fried egg. It was so huge I couldn't actually eat it all in one go no matter how much I tried to squish it all down but it was very satisfying and one of the best burgers I've ever had. Whilst lunch was delicious we did somewhat regret eating so much at lunchtime as it pretty much left us zonked for the afternoon and the rest of our day passed far too quickly. We spent the last few hours of our day in the main shopping area of Princes Street hopping in and out of all the department stores testing out the sofas for the house we haven't bought or finished saving for yet. Our explore introduced me to Jenners which was the oldest independent department store in Scotland until House of Fraser took it over a few years ago. Luckily it's still kept it's original location on Princes Street where it's stood since the 1800s and has still maintained it's identity and charm. 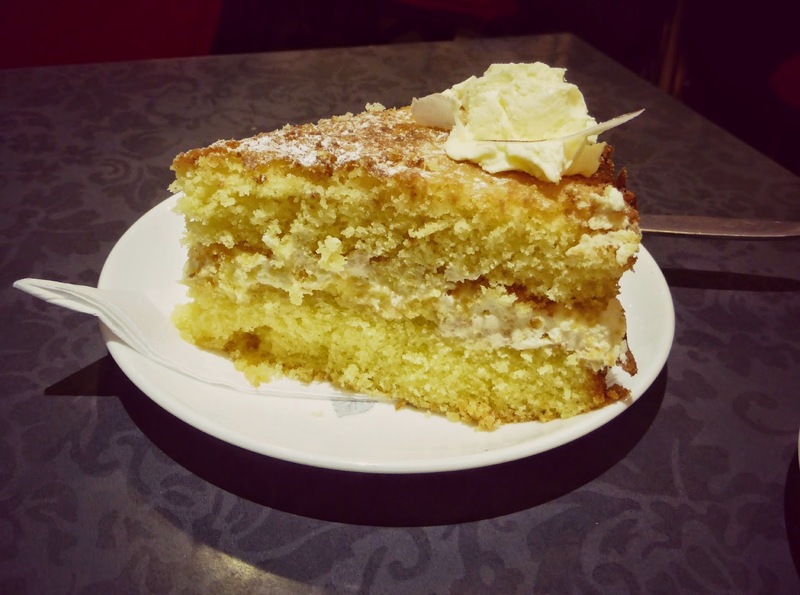 We obviously couldn't leave Edinburgh without cake so despite being full and only having an hour to cram in as much cake as possible before our train we rushed to Eteaket on the recommendation of fellow local blogger Sarah. Sarah is someone who also understands the meaning of good cake so I knew her suggestion would be worth following. Eteaket is a gorgeous little tea room full of brightly coloured comfortable chairs, quirky lamps, beautiful crockery and most importantly really good cakes in interesting flavours. You know you're somewhere great when you can't pick between the cakes, the choice was so good. I almost went for the chocolate and beetroot cake but in the end favoured the rhubarb victoria sponge whilst Simon had a slice of lemon and coconut. Rhubarb works so well in cake, I loved how the sharp taste of the rhubarb mixed perfectly with the sweet sponge, I could have had slice after slice. 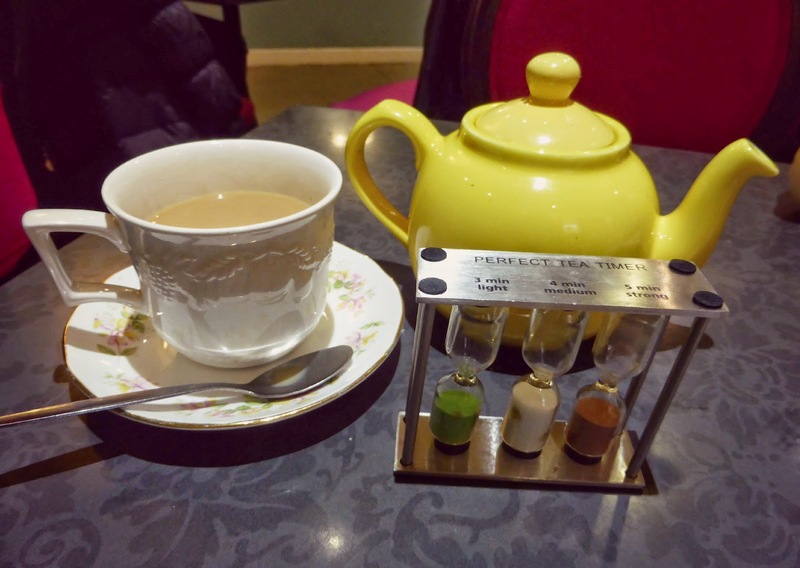 I had with it the perfect cuppa, I knew this because it was served to me with an egg timer telling me exactly when to take my tea leaves out of the pot and start pouring. Simon decided to try a chai tea latte, tea mixed with sweetened milk - he kindly let me have a sip and then I got a bit of drink envy because it was that good. The time to catch the train home came round so quickly. As a kid my Mum always said to me "it's better to leave a place wanting more". Edinburgh we want more and we will be back! You can but try eh?! I mean .. I say I didn't plan yet I clearly researched where Primark was, googled the burger place and asked Sarah in advance for cake recommendations! Other than that no planning :p It was a start anyway! 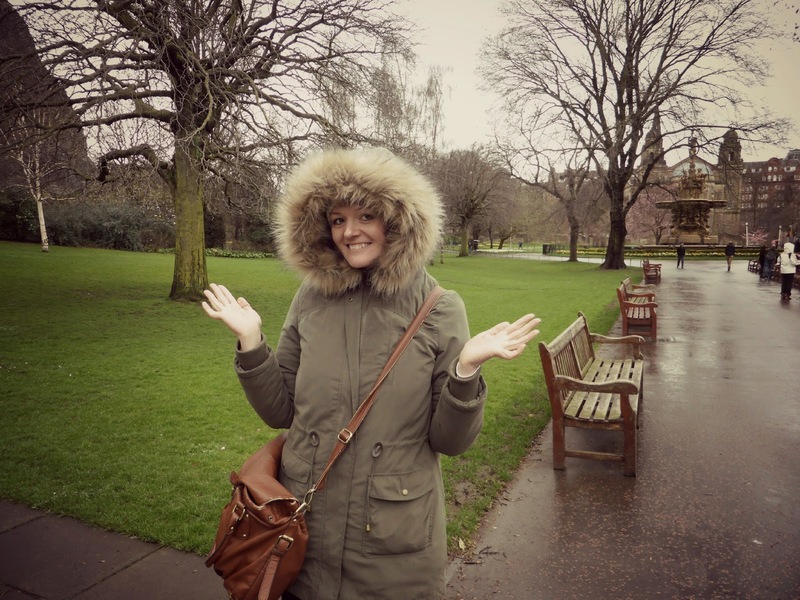 Yey for Edinburgh!! Being originally from Berwick (in the middle of Newcastle and Edinburgh) I've visited it lots! It's a shame it rained, but your looked very stylish in your new coat - I love it! The photos you got from the gardens are really fab too!!! Have you ever been into Mary Kings Close? It makes for a good, if not scary, activity for a rainy day in Edinburgh. Hee! Thanks for the description of where Berwick is, I love when people explain local geography to me cos sometimes I'm a little "eh?!" I was expecting a little rain so it wasn't too bad, just hope it's nice and dry when we go back to climb Arthurs Seat or we'll be slipping and sliding all over the place! I think Mary Kings Close might be a bit scary for me, I'm the world's biggest wuss .. Im the girl who went to London Dungeons on a school trip in Year 10 and was so terrified I hid in the gift shop for 2 hours! I know, I'm too excited about it :) Love being in easy reach of lovely places .. we're also so close to York and Durham so very spoilt for beautiful towns and cities to visit. Edinburgh is so gorgeous, probably one of my favourite towns in the UK!! I'm the same about planning, Mr S dreads the excel spreadsheets that I make for our holidays!! This is the one thing I kick myself about in hindsight about the four years I lived in Newcastle, I really never used it as a base for exploring and i love train travel but the two things never clicked in my brain. I wish i'd of broken myself away from the books and done a bit more travelling. 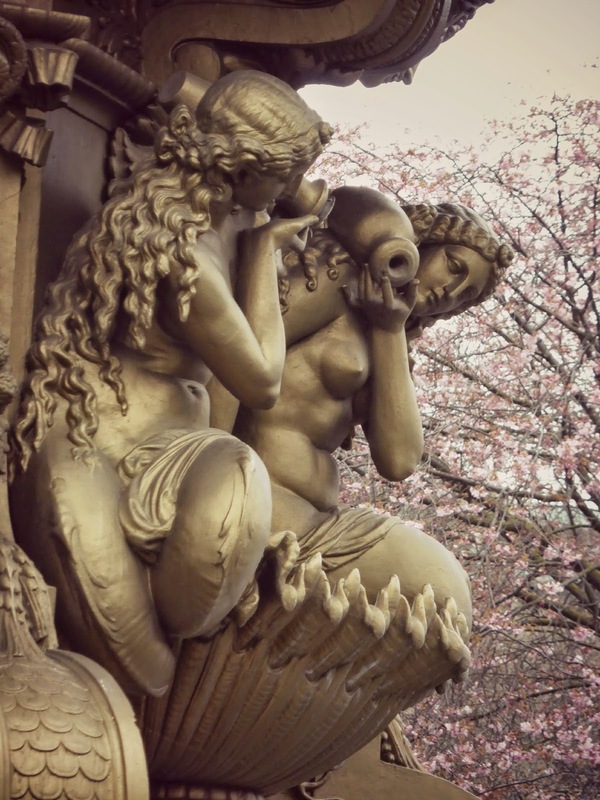 Great pictures though, had many a fun visit to Edinburgh over the years! 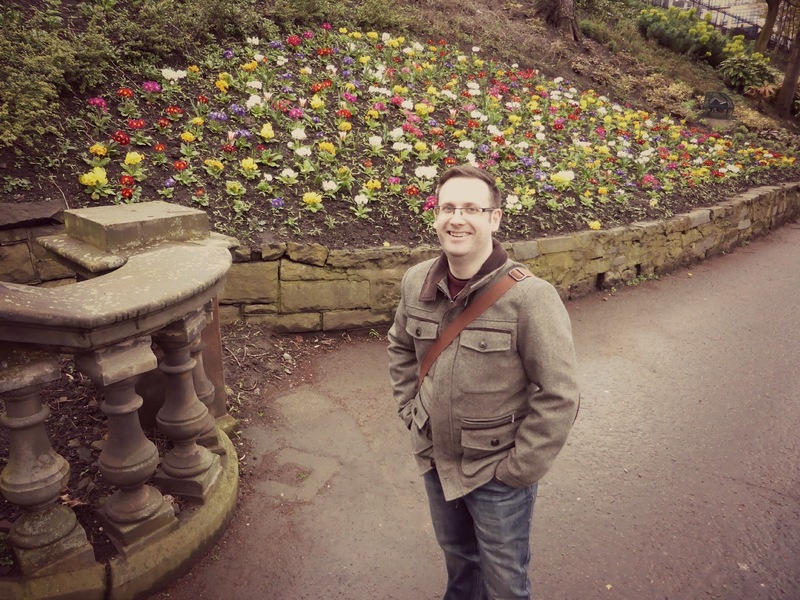 Looks like you had a great time - you should def go back for the fringe/festival in Aug! Viva Mexico is quite a nice Mexican in Edinburgh - the cafe looks really nice too! Ooooooooh yes I have heard of Mimi's but when I looked it up I realised it was a bit of a walk out of the city (didn't even occur to me to get a bus - DOH!) Next time! Hi sweet!! !What a lovely post! 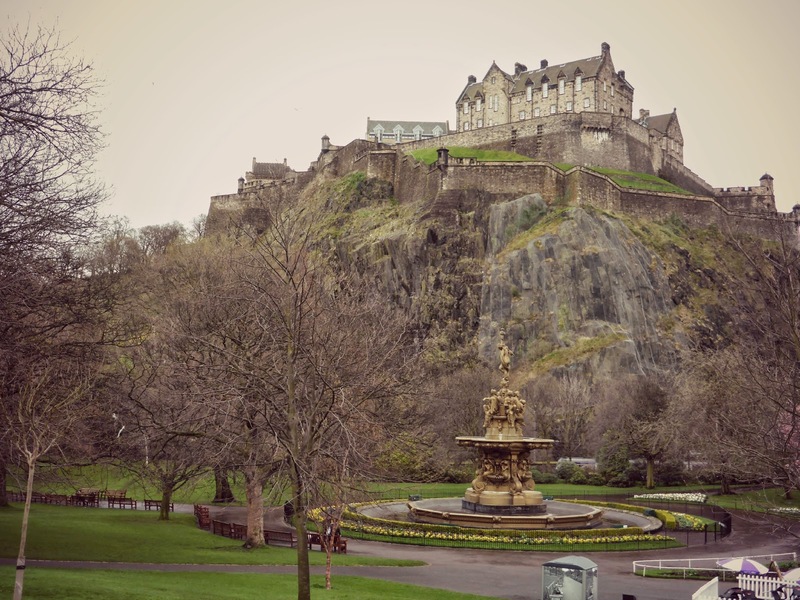 !IIt would be wonderful for me to visit Edimburgh :)..it seems a beautiful city!! !I really like your photos..especially the ones about food;)!!! Such a beautiful city - full of old buildings, cobbled streets and lovely restaurants .. my kind of city! 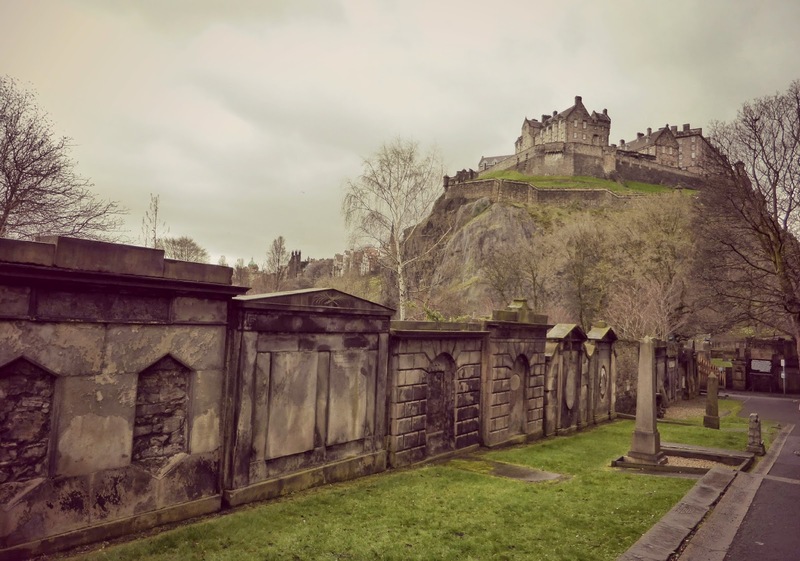 I'd love to go to Edinburgh but it's SUCH a trek from Devon, looks gorgeous though! You always look so cheery!! Hun well done on losing 9 stone that's an amazing achievement, and Edinburgh is one of the most beautiful places it's so nice. 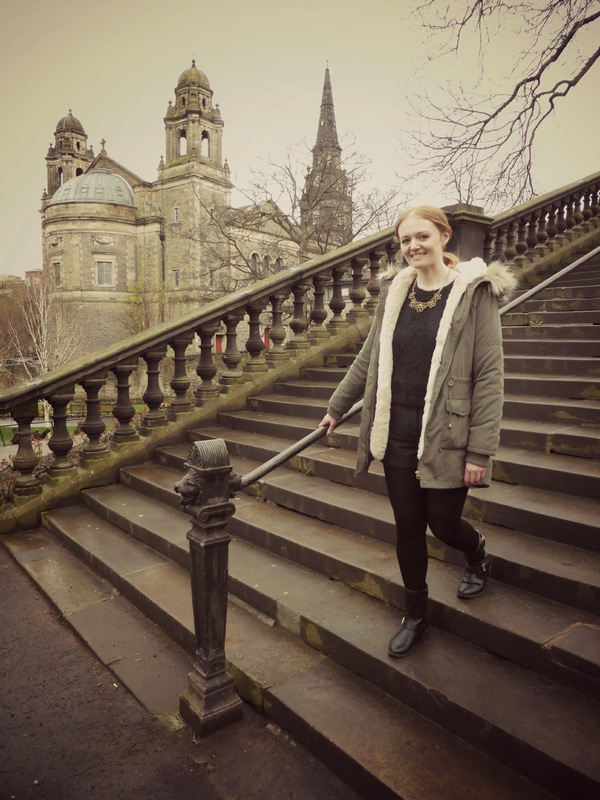 I love Edinburgh, and I really love that it's close enough for a day trip! And as for researching where Primark is... You're a girl after my own heart! I do exactly the same thing!! One of these days I'll actually start checking off which stores I've been to...! HEE! One day Simon will learn that Primark is always my priority when we're in a city. When we went to Norwich a few weekends ago to visit my family I purposely got into the city 30 minutes before our table was booked for dinner just so I could have a quick look round Primark ... I think I might have a problem? !